The PyraLight pad creates a healing pulsed magnetic field at the Schumann 8Hz frequency, along with pulsed 850nm Infra Red light. This pulsed field allows stressed and unbalanced areas of body to start to self heal. Placing a glass of water on the pad for 5 minutes or longer structures the water, and you can taste the difference compared with the original water. The PyraLight pad therefore structures the water inside your body. Cells can only absorb structured water through the channel proteins of the cell membrane. The pad also interferes with, and therefore reduces, radio frequency EMFs from phones and WiFi in your environment. The pad can be safely used as long as you wish, you can leave it running all the time to clear the EMFs in your environment. Generally the easiest way to use the pad is to place it, LEDs pointing up, under your pillow overnight. Your body will guide you how long to run it, which is as long as you feel comfortable. You can also place the pad wherever you like on top of your body, LEDs pointing down. It is not recommended that you lie on the pad, in order to protect the pad itself. 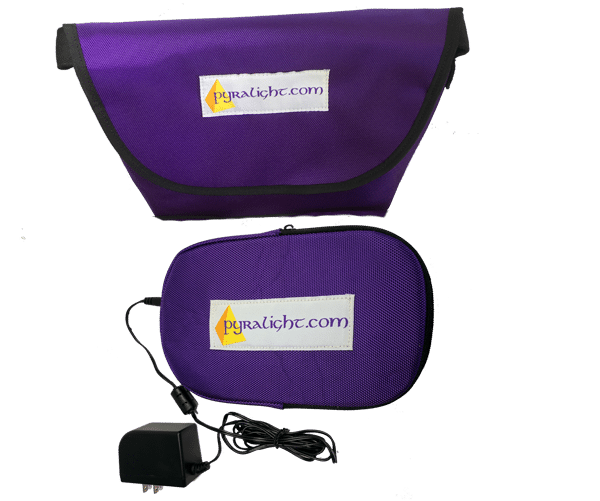 The PyraLight 2 Pad builds on the wonderful healing experiences users have been having with the original PyraLight Pad. PyraLight 2 offers greater ease of use and convenience by integrating all the control logic into the pad itself. In addition, all the frequencies used in PyraLight 1 have been combined so they are always present with PyraLight 2. The extra pad can also be used with PyraLight 2, connecting by the 1/4inch cord from the jack on PyrLight 2 to either of the extra pad jacks. The PyraLight pad was developed by Guy Harriman in early 2017, and the technology has been in evaluation since Februray 2017. The PyraLight pad works individually with each person, so experiment for yourself.